This dish is as much potent medicine as it is a delicious recipe. Roasting brings out the natural sweetness of the squash, which helps keep my sweet cravings at bay. Add a bit of soothing ginger, immune-supporting pumpkin seeds and my favorite super-food, kale, and now I have a dish I could eat all winter long! When I’m not enjoying this as a side dish, I add a cup of cooked cannellini beans to make it a complete meal. 2Peel squash, remove seeds and chop into bite-size pieces. In large bowl, combine squash with 2 tablespoons olive oil and sea salt. Spread out onto cookie sheet and roast 30 minutes or until soft (time will vary according to how large or small you cut the squash). Remove from oven and set aside. 3In Dutch oven over medium low heat, melt coconut oil. Add leek, increase heat to medium and sauté until soft (about 2 minutes). Add garlic and ginger and sauté 2 minutes longer or until fragrant. Fold in kale a little at a time until it all fits in pot. Cook until tender and bright green, adding water1 tablespoon at a time as needed to prevent burning. Remove from heat, fold in roasted squash and toss to evenly distribute. 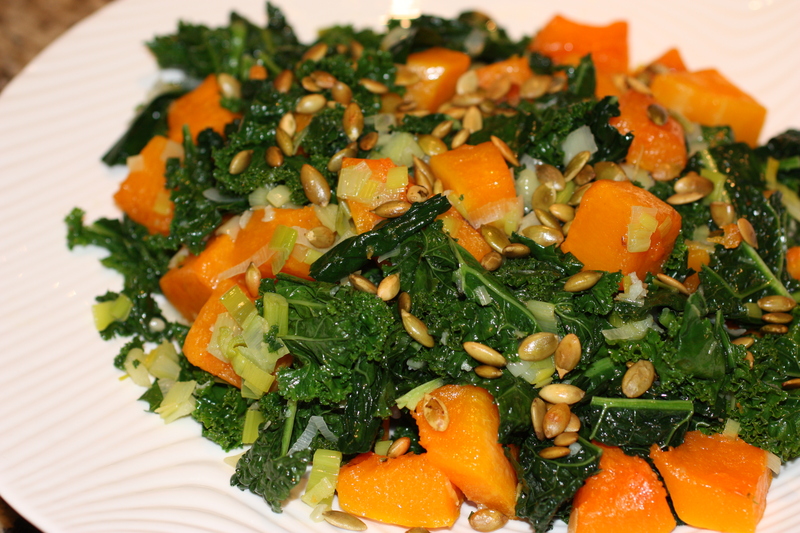 Top with toasted pumpkin seeds and serve.